Arsenal manager Arsene Wenger has warned it will be "difficult" to extend Theo Walcott's contract if the forward has not agreed a new deal by April. 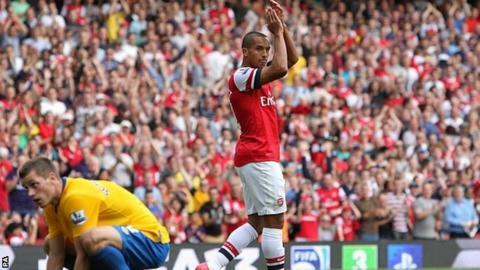 Walcott is in the final year of his contract and rejected a new five-year deal worth £75,000 a week in August. "If in April it is not done, you can think it will be difficult to do," said Wenger of further planned negotiations. Wenger also suggested that he may be reluctant to select the 23-year-old if an agreement is not reached. Walcott has started only one game so far this season - the club's opening Premier League match against Sunderland - and received a mixed reception from the home fans when he was introduced as a substitute against former club Southampton at Emirates Stadium. Wenger insisted that the England international's place on the bench was not a consequence of his failure to agree new terms, but admitted that it may come into consideration if the matter remains unresolved. "I still hope to extend his contract so, at the moment, it doesn't affect me. Of course at some stage..." the Frenchman added ahead of his side's opening Champions League match against Montpellier on Tuesday. "You want your players to be supported no matter what kind of contractual situation they are in. I hope it will not affect him and that it will not affect our fans." Walcott, who joined Arsenal in a deal worth about £12.5m as a 16-year-old in January 2006, could sign a pre-contract agreement with another club in January. By the end of the season, he will be 24 and entitled to move as a free agent at the end of his contract. Arsenal sold striker Robin van Persie to Manchester United for £24m in August after the Dutchman announced that he would not extend his contract which, like Walcott's, was due to expire in June 2013. Twelve months previously, Arsenal sold Samir Nasri to Manchester City, a year before the end of his own contract, after the French international turned down an extension.